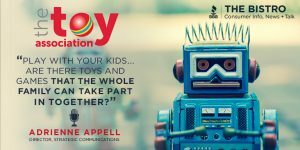 Adrienne Appell, Director, Strategic Communications, at The Toy Association stops by The Bistro to give us another perspective on toys that go beyond play. In addition, just in time for holiday shopping, she shares some of the toys that are the “hot” list for kids this year! Listen in.